The Vapor Wake® training process is scientifically-based and so technically developed that Auburn was granted a patent for it in 2015. Man’s best friend has long been known as the perfect companion. In exchange for food, water and a pat on the head, a dog will love and defend its owner. Pioneering research begun 16 years ago at the College of Veterinary Medicine has led to patented technology to prove that the ”Auburn Dog” is the world’s most advanced mobile detection system to defend an area from a potential attack. Explosive-detecting dogs are a common sight at train stations, sports arenas and on city streets, patrolling with their police partners. These canine sniffers search baggage and people for contraband or bombs. Others have been trained to find illegal fish fillets and pythons in the Everglades. What makes the “Auburn Dog” stand out among his peers? These canines are Vapor Wake® dogs, and their training process is scientifically based and so technically developed that Auburn was granted a patent for it in 2015. Dr. Paul Waggoner, co-director of the college’s Canine Performance Sciences program, and a team of researchers applied the physics of fluid dynamics developed by Gary Settles and his colleagues at the Penn State Gas Dynamics Laboratory to guide their development and training for Vapor Wake dogs. Settles’ studies showed that people in motion leave a thermal ‘plume’ in their trail, much like the wake a boat leaves as it speeds along the water. This heat signature is invisible to the naked eye, but can be seen through Schlieren photography. This plume effect occurs inches from the body, the odor and particles coming off the person are sucked into the aerodynamic plume created by forward motion. Since bombs release particulates denser than air when degrading, traces of it are caught in a culprit’s heat signature plume and broadcast behind him. When a Vapor Wake dog catches that targeted scent, it will track that odor until the source of it is identified. Then the authorities step in. Dogs are inherently great detectors. They experience scents similar to the way people see color. With up to 300 million olfactory receptors to our only six million, it is through their noses that dogs truly see the world. The portion of their brain dedicated to their sense of smell is almost 40 times greater than our own, enabling them to separate bouquets of aromas into individual scents, no matter how nuanced. Their nostrils operate independently, enabling them to determine the direction of an odor via intricate, chamber-laden structures that help them detect scents in parts per trillion. One part per trillion is the equivalent of sniffing out one drop of Kool-Aid in 10 Olympic-size swimming pools. What’s the different between traditional detector dogs, who are led by their handlers to inspect suspicious items or screen passengers, and Vapor Wake dogs? 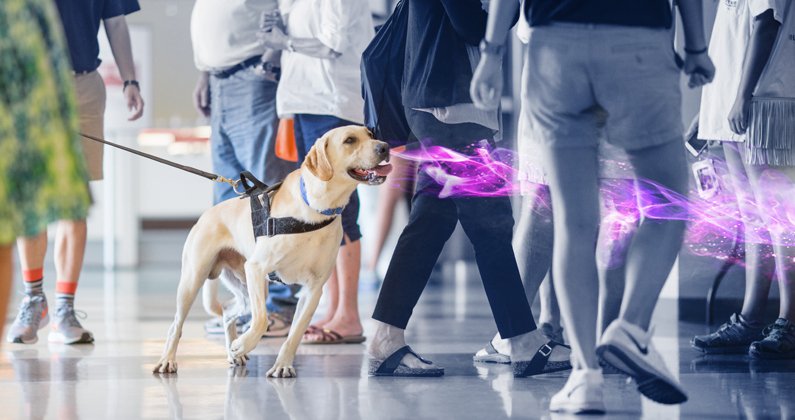 Handlers are trained to walk behind the dog through a crowd of people, while the dog checks the air for tell-tale whiffs of dangerous chemicals. Instead of being obedient to handlers, these dogs are obedient only to the odor of a bomb or weapon. The first Vapor Wake dogs were produced in 2004; by 2010, they were being used by Amtrak Police and U.S. Capitol Police. Around this same time, a study by the Pentagon was published showing that the use of trained canines to locate Improvised Explosive Devices (IEDs) vastly improved the military’s ability to find bombs–an 80 percent success rate. Detector dogs are now commonplace on transit systems and police squads. Use of the dogs is now promoted prior to large gatherings, such as the Macy’s Thanksgiving Day parade because people feel more secure going to those types of events knowing that part of a venue’s safety plan is detector dogs. Auburn’s commercial partner in producing and training Vapor Wake dogs is VWK9, while the college’s Canine Performance Sciences group focuses on continued research and technology, as well as breeding and early training. Every canine that is developed through the breeding program has its medical, environmental and performance data collected and analyzed. This allows CPS to quantify a canine’s capabilities and to identify the best dogs for breeding. This practice makes genetic progress and increases the performance and capabilities of the dogs over previous generations. About 60 dogs per year are bred, relying on sound genetics and using several specialty services in the College of Veterinary Medicine’s Wilford and Kate Bailey Small Animal Teaching Hospital. Socialization of the puppies begins at birth. As puppies grow, CPS staff acclimate the litters to crowds and noisy public places. They also are introduced to different floor types, so they will know how those feel under paw. All the while, they are being rewarded for tracking. Their prize? Tennis balls. Early training continues with CPS staff and volunteers, including an Auburn University undergraduate class. During their development, the dogs enter a four-month canine program, developed by Auburn CPS, in federal prison systems in Georgia and Florida. While there, inmates observe the dogs 24/7 and are trained to reinforce the dogs’ track-and-reward behavior for being successfully trained as detector dogs. The program is well-received by prisoners and the system, with inmates earning education credit for their work. When the dogs are about a year old, the dogs are sent to VWK9 in Anniston, Alabama, and their training shifts to more specialized bomb-detecting scenarios. In total, Vapor Wake dogs are trained for 15-18 months, compared to only two- to four-months for standard explosive detection dogs. What’s the future for detector dogs? The CPS team is involved in a number of collaborative research programs with colleagues to better understand the full capabilities of a dog and find ways to apply what they have learned to new discoveries. Waggoner and his team are conducting a comprehensive study using MRI scans of dogs to understand how their brains work with their olfactory systems to become such expert detectors. Charting the genetic structure of the Auburn Dog colony may help unlock that answer, and newly hired Dr. Xu Wang, an assistant professor of comparative genomics at the College of Veterinary Medicine, has brought his genomic expertise to the task. There is much ground to cover before that DNA sequencing can occur, but Dr. Wang was part of a team that profiled the genetic structure of a colony of silver foxes in Siberia that, for more than 50 generations, was selectively bred for tameness or aggression. Being able to drill down to the exact genetic markers needed will aid the breeding program for Vapor Wake dogs and, perhaps, solve the mystery of how a dog’s nose and brain work in concert to detect and track an odor.